PLUS MORE GAMING SECRETS: Ubisoft's Next Big Thing - PS3 Horror Game MIA - Modern Warfare Lives? Among the items in the portfolio of a former artist at short-lived studio Killspace Entertainment is the pitch trailer below for the studio's rumored Apocalypse Now game. They&apos;re Gonna Make An Apocalypse Now Game? Really? Set to audio of actor Marlon Brando's reading of T.S. Eliot's poem "The Hollow Men," the trailer depicts a succession of iconic images from the film in computer-generated form, and largely seems to hew to the film's hypnotic, heady tone. Curiously, the trailer ends with the logos of both Killspace and American Zoetrope (who owns the rights to the film), possibly suggesting that filmmaker Francis Cord Coppola—or at least his company—was on board for the project. 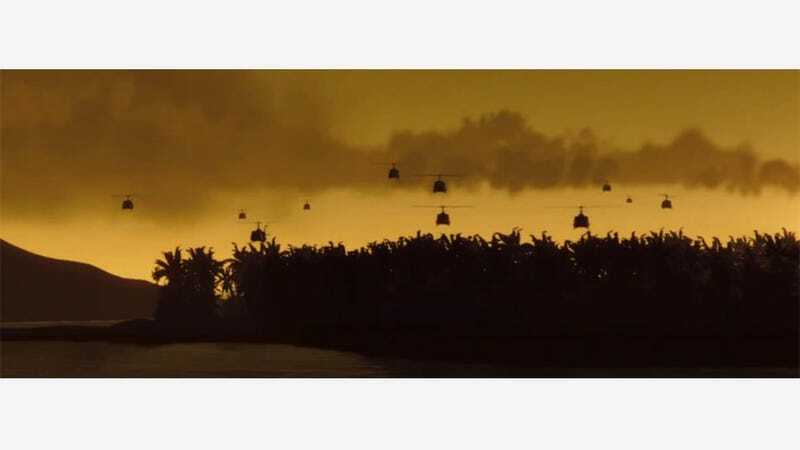 Coppola approving a potential Apocalypse Now game would be a surprising prospect, given the director's vocal dissatisfaction with EA's Godfather game. In a New York Times piece profiling beloved game critic and Gears of War: Judgement co-writer Tom Bissell, writer Chris Suellentrop quietly mentioned Bissell had met Rob Auten, his current writing partner, while Auten was trying to get an Apocalypse Now game off the ground. In another interview, Auten said he had recently read Bissell's Vietnam book The Father of All Things: A Marine, His Son, and the Legacy of Vietnam, and thought Bissell would be the perfect partner for the project given his expertise. A few years ago, I was working on a shooter (now canceled) set within an inglorious American war infrequently visited in the video-game space. In truth, the game wasn't precisely a shooter, which was, I suppose, part of the problem. One idea that came up was to completely remove any kind of feedback loop when shooting. By that I mean you wouldn't have any idea whether or not your shots were hitting their targets. You'd just fire into the jungle and hope for the best. Maybe you'd find some bodies later, if you bothered to look. That would be your feedback loop: dead bodies. Combat would be somewhat randomized, in that it would always sort of be going on in the background. Everything was supposed to be tense at all times. The NPCs with you could die at any moment and, once you lost them, they were gone; the game's story was going to be designed to function without them. As a thought experiment, it sounded incredible: a war game that functioned like a survival horror game. The goal was to make a real war game, something that felt cruel and strange and oppressive, but also genuinely exciting when it had to be, because every combat vet I know, including my shooter-hating father, has described how beautiful and oddly life-affirming combat can sometimes feel. Whether Killspace, Auten and Bissell would have pulled off a reverential Apocalypse Now game is unknown, but it is evident that the three were fairly thoughtful and considerate about extending the film to the interactive space. Several weeks ago, the organizers of the Game Developers Conference Europe revealed a previously unannounced Ubisoft Montreal project Child of Light that will be officially unveiled at a talk titled "Small Projects in AAA Studios." Led by Patrick Plourde, creative director on Far Cry 3 and lead designer of Assassin's Creed II, Child of Light is said to be "the opposite" of Plourde's previous AAA endeavors: a game with "a small team, a small budget, and an intimate scope," and "a game with an indie mentality within the walls of a major studio." But despite the rhetoric of Child of Light being a smaller and intimate quasi-indie title, Ubisoft seems to think they might have another major transmedia intellectual property on their hands. In addition to childoflight-game.com, the company also registered: childoflight2.com, childoflight3.com, childoflight4.com, childoflight5.com, childoflightcomics.com, childoflightfilm.com, childoflightmovie.com, childoflightonline.com, childoflightthefilm.com, and childoflightthemovie.com. Recent Ubisoft trademark applications seem to corroborate those ambitions: the company filed applications for "Child of Light" pertaining to books, apparel, musical recordings, and toys. Jeffrey Yohalem, the provocative writer of Far Cry 3, cryptically suggested on Twitter that he is working on Child of Light. The project would mesh with sentiment Yohalem aired in a recent interview about his next project being a radical departure from Far Cry 3 and the FPS genre. Also of note: Following the E3 announcement of The Crew and The Division, Ubisoft filed trademarks and registered domains pertaining to feature films based on the two properties. The trademark filings also oddly encompass "[the] presentation of live stage show performances, [the] presentation of live show performances by costumed characters, and [the] presentation of live theatrical performances." If they could turn Spider-Man into a musical, why not a post-apocalyptic Tom Clancy MMO? Despite dropping completely off the radar following a showing at last October's New York Comic-Con, the PS3 horror game Until Dawn still seems to be in development. In late May, a games recruitment agency posted a handful of openings for an unnamed UK developer matching copy and openings from the site of Until Dawn developer Supermassive Games. Most of the agency openings also unambiguously allude to Until Dawn as a "horror adventure title whose inspiration is driven from timeless horror movie classics" in development at the studio. Until Dawn was announced at last year's Gamescom conference as a game requiring Sony's Move motion controller peripheral, though Kotaku's Stephen Totilo said developers were exploring the possibility of incorporating more normal controller support when he previewed the game last October. And since the game's last appearance, Sony has announced its next-generation PS4 platform, so it is entirely possible the game could now be cross-generation or next-gen-only. Until Dawn has been in off-on development for a number of years at several studios. Originally, Sony's London studio worked on the project for at least a year or so until April 2011, when Sony reviewed its UK development operations, leading to a handful of project cancellations and redundancies. Finally, despite Infinity Ward moving onto the Call of Duty: Ghosts brand, it appears more Modern Warfare games are still coming. On his CV, an FX artist who joined Modern Warfare 3 co-developer Sledgehammer earlier this year says he is working on "the next Call of Duty - Modern Warfare release." Perhaps this is Activision's 2014 Call of Duty title?